Pretty cool local opportunity coming to Blackfly on July 30th. 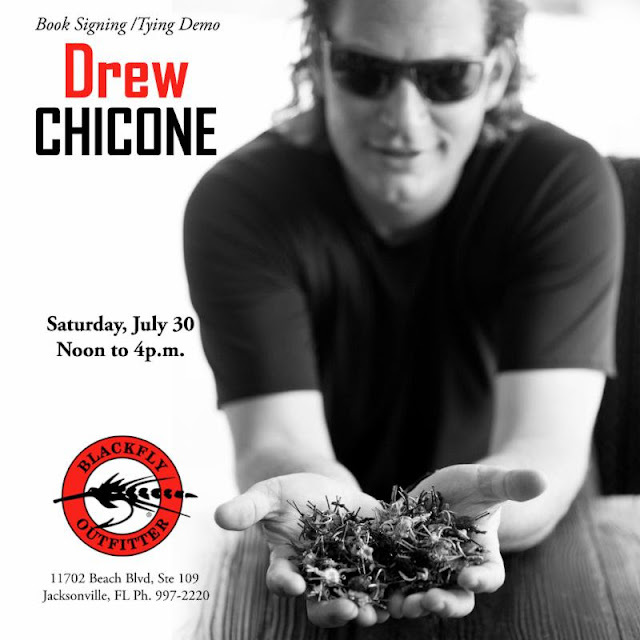 Drew Chicone will be on site tying some of his signature patterns from 12 pm to 4 pm. Join us in the store for a cold beer and some great fly tying! Learn some excellent saltwater patterns from one of the best tiers around. You have probably seen some of Drew's patterns online or published in magazines including the Captiva Cannibal, Coyote Ugly, and Disco Shrimp. Drew is a tying contributor/designer for Umpqua Flies and is also the author of the very popular book "Feather Brain"! Don't miss the opportunity to see Drew in action and pick up a signed copy of his book! Also, during the event we will be running happy hour at the Tarpon Taproom...Miller & Yuengling are 1/2 OFF as well as $6 glasses of wine!! !